Before your actual photo retouching work, lightly touch up your original RAW photo in the Develop module. The edits you make here will help to prepare the picture for more detailed work in the Editor. They’re generally somewhat the opposite of what you’d be doing if you were finalizing the photo at this stage. This photo has a strong blue tint, as you can see just by looking at the originally gray background on which it was taken. We’ll fix the white balance using the eyedropper in the White Balance group in the Adjustments panel. On the other hand, the lighting for the photo had the right brightness, so no exposure adjustments are needed. Even still, however, it’s good to brighten a photo’s shadows and pull the bright tones back a bit. This gives you more leeway for later edits. Although it does reduce the contrast, we’ll be fixing that at the end of the process. The Develop module automatically sharpens photos that are in the RAW format. This is good if you’re only using the Develop module, but here we’ll be continuing on to the Editor. So it will be better to prevent this sharpening. Taking an already-sharpened photo with us into the Editor would mean also bringing in any unwanted elements (halos, etc.) that were caused by the sharpening Always wait with your sharpening until the end of your editing work! 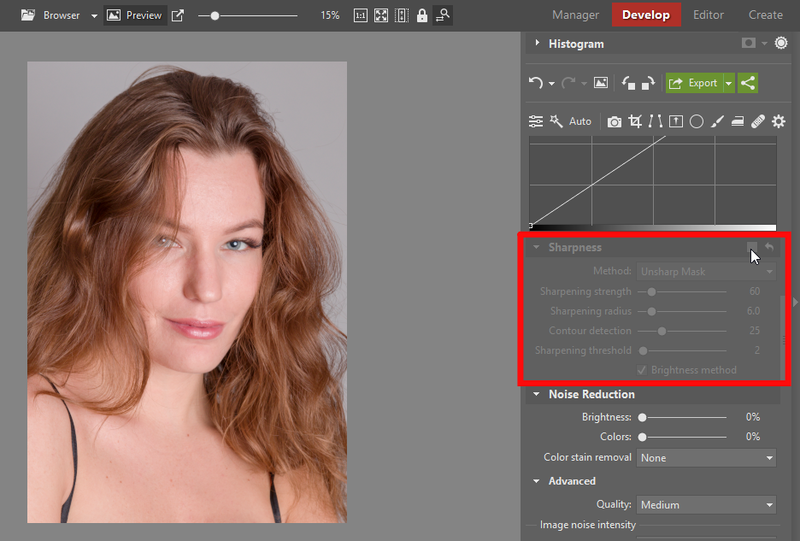 There’s no direct and immediate way to turn off the Develop module’s sharpening, but there’s still an easy way to do so. First change a value of your choice in the Sharpness controls. When you do this, a checkbox for turning off the entire Sharpness group appears. Just for example, change the sharpening method from Unsharp Mask to Smart Sharpen. Then uncheck the checkbox in the Sharpness group’s header to deactivate all of these controls. Now the photo is ready for your work in the Editor. You can find a variety of guides on the internet that recommend fixing skin defects by blurring a model’s skin. But don’t do that. Blurring skin destroys its structure and turns a natural portrait into one that looks like a wax figurine. For the same reason, avoid using Zoner Photo Studio’s Iron (U) tool for this job. The two basic methods for fixing skin defects are via the Healing Brush (J) or via Dodge (I) and Burn (Shift+I). Here we’ll be focusing on the Healing Brush. 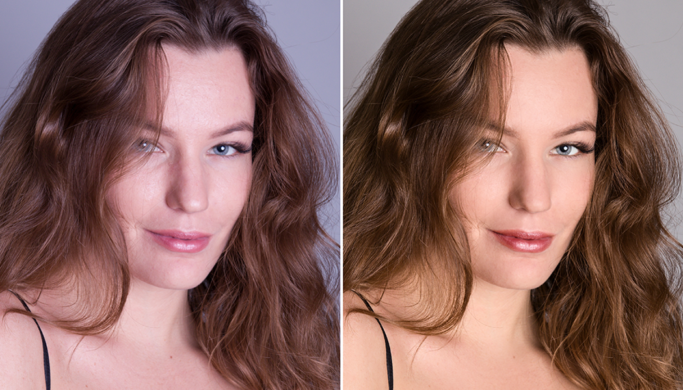 But you can learn about the dodge-and-burn method in our article Get Great Photo Retouching With (Almost) Just Lightening and Darkening. Before using the Healing Brush, create a new layer. 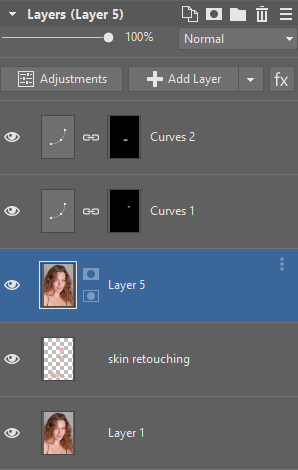 We’ll name ours “Skin Retouching.” Set Current Layer and Layers Below It as the Source for the Healing Brush. 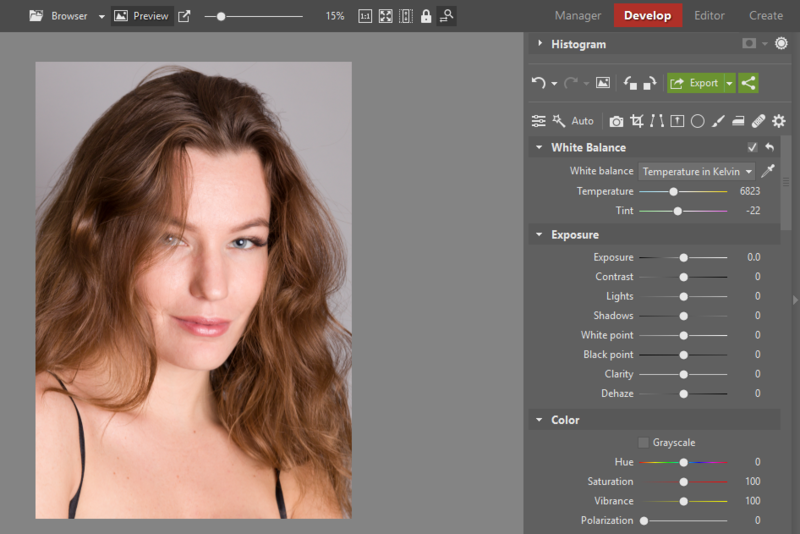 Hold down Ctrl on your keyboard and click into some healthy skin to set the sample used for the retouching. Paint with the brush to fix the skin’s texture (to soften the skin and remove large pores). In this case the edit we’ve made is too strong and would almost entirely remove the skin’s structure. So we reduce the Opacity to 50%. A detail from the original photo. Edits made with the Healing Brush with 100% opacity. Reducing the Healing Brush opacity to 50%. This edit has softened the skin while keeping its structure. The eyes are the most important part of every portrait. They should be focused and clear so they’re attention-getters. 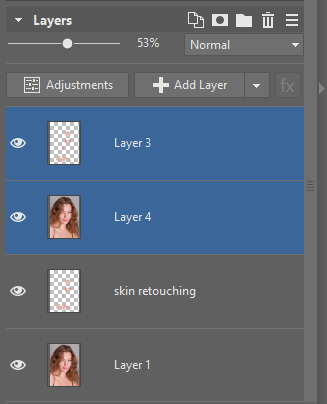 Select the “Layer 1” and “Skin Retouching” layers and duplicate them using the Layer – Duplicate Layer menu item. Use Layer – Merge Selected to merge the layers into a single layer. 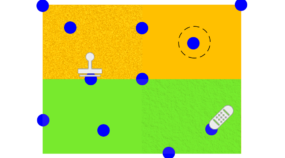 Activate the Effect Brush (E) and set its Mode to Sharpen. 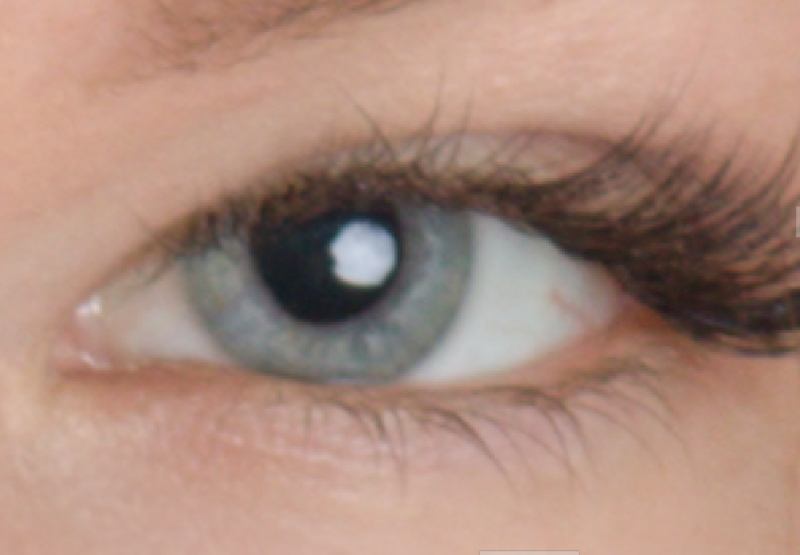 Reduce its opacity to 40%, and with these settings, use the brush to sharpen the eyes (the irises and pupils). Then switch to the Clone Stamp (S) and remove any veins that are visible in the eyes. In this example, we’re also removing the tear that’s at the bottom edge of the iris. 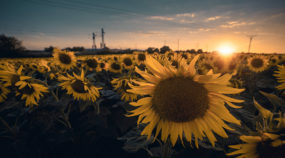 To learn more about work with the Clone Stamp, read our article Discover New Possibilities for Retouching: Learn the 5 Ways to Remove Distractions. Here we’ve sharpened the eyes, retouched away veins, and removed the tear from the bottom edge of the eye. To brighten the eyes, add a Curves layer by using the Layer – Add Layer – Curves… menu item. Then reshape the top of the curve to brighten the image. Then add a mask to the layer by using Layer – Mask – Hide All. This masks the whole Curves layer (for now), hiding its effects everywhere. Then switch to the Paintbrush tool (B), set its color to white, and unmask the eyes by drawing onto the mask. Then use a similar approach with a White Balance… layer to remove the tint from the whites of the eyes if they’re tinted. 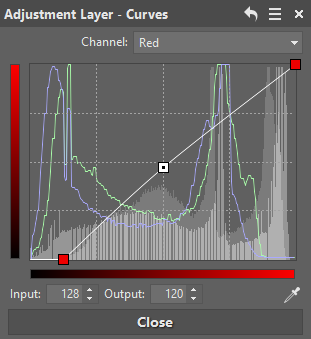 To brighten your subject’s lips, use a Curves layer again: Layer – Add Layer – Curves…. Add contrast using an “S” curve in the RGB channel. Then switch to the Red channel. Here we’re moving the left node rightwards and slightly bending the curve upwards to highlight the subject’s red makeup. Wrap up this particular edit by using Layer – Mask – Hide All and then painting in white with the paintbrush to uncover the effect on top of the subject’s lips. Now set the layer’s mode to Burn. If the effect is too strong, reduce the layer’s opacity to weaken it. The subject’s lips before our edits. 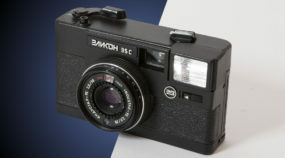 When you were preparing your photo in the Develop module, you deliberately lowered the contrast and avoided sharpening. Now at this stage in your editing work, you’ll need to make up for that. To bring back the contrast you removed, use an editing layer once again: Layer – Add Layer – Curves…. Bend the curve into an “S” shape. Set the layer’s mode to Lightness. 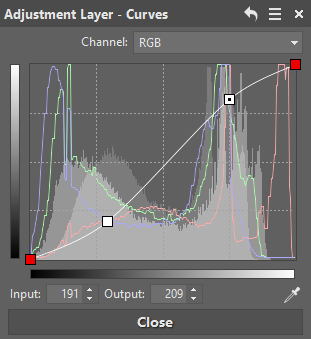 This limits the layer’s effects to tone adjustments only, preventing any color shifts. For your sharpening, you’ll have to have the picture as all one layer and work with that one layer. Save your work to a file in the ZPS format and then merge all the layers using Layer – Merge Visible. Then go to the Menu and use Adjust – Sharpen (Ctrl+5). To double-check that the sharpening isn’t too weak or too strong, magnify the display to 100% zoom and inspect it. To learn more about sharpening photos, read our article named How to Sharpen Your Photos: Beat the Blurry Blues. The edits we’ve presented to you here are a good foundation for portrait editing—they remove skin defects while highlighting elements that are important for every portrait: the lips and eyes. 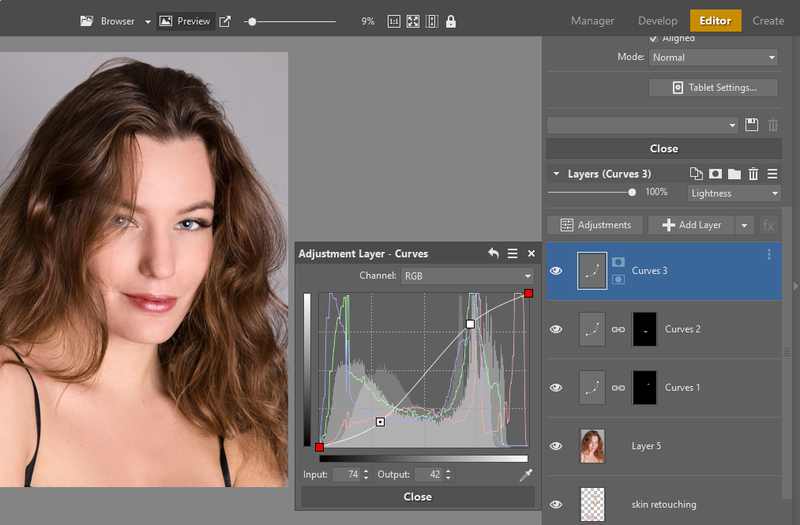 This approach is especially useful when retouching portraits of women. Highlighting the eyes is also useful for portraits of men and children. But softening the skin in portraits of men tends to be counterproductive and look very unnatural. So when you’re retouching portraits of men, stick to just removing problems like shaving cuts and acne. 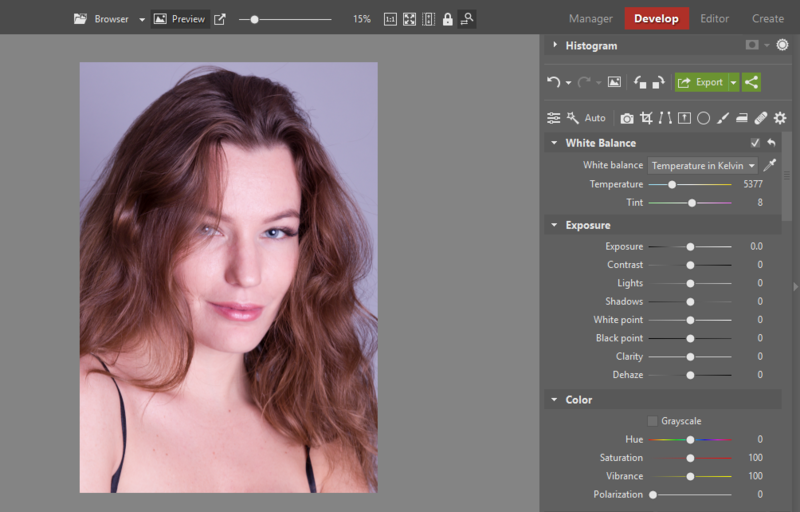 There are far many more portrait edits you can do besides just what we’ve listed in this article. They include such things as edits to hair and modeling the subject using lights and shadows. Often you’ll see photographers shaping their subjects and changing their proportions as well.